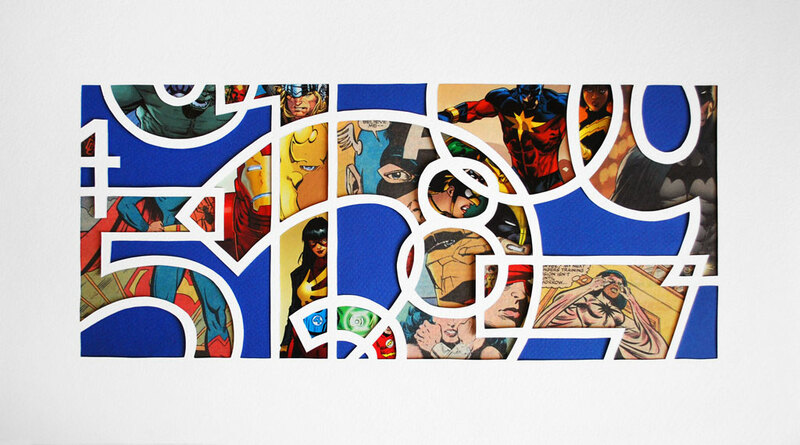 Isaac Brynjegard-Bialik: Nice Jewish Artist: "Number Theory: Heroes"
Just completed this piece to submit to Deloitte -- yes, my work life and art life have come together in a weird venn diagram of awesomeness. My art is a blending of traditions, using the mythos and imagery of comic books to explore themes of identity and connection to the world around us. In this piece, which I created specifically for submission to Deloitte University, the papercut is built on a structure of the ten basic Hindu-Arabic numerals (0123456789), symbolizing the outward appearance of an organization built on – and dedicated to – numbers. But of course, Deloitte is much more than that – it is an organization of individuals, who each bring with them particular strengths and skills and backgrounds and make the organization more than the sum of its parts, and more than just about “numbers.” We are, all of us, heroes to ourselves and to others; it’s part of our shared values that we be the best we can be, and that we help others to do the same. And so the background texture for the cut is a collection of superheroes, representing our strength and diversity and commitment to individual performance, positive team dynamics, and joint success. And yes, I do *love* where I work.